For the American football defensive end, see William Fuller (American football). For other people with a similar name, see William Fuller (disambiguation). William Vincent Fuller V (born April 16, 1994) is an American football wide receiver for the Houston Texans of the National Football League (NFL). He was drafted by the Texans in the first round of the 2016 NFL Draft. He played college football at Notre Dame. One of five siblings (he has 4 sisters), Fuller attended Roman Catholic High School in Philadelphia, Pennsylvania, where he played high school football for the Cahillites. As a senior in 2012, he was named the MVP of the Philadelphia Catholic League 4A, recording 57 receptions for 932 yards and eight touchdowns. Considered a four-star recruit by Rivals.com, he was rated as the 19th best wide receiver prospect of his class. He originally committed to play college football at Penn State on June 3, 2012 after receiving a scholarship offer while on a visit at the school. However, Fuller would go on to switch his commitment to Notre Dame on August 5, 2012. "Notre Dame Football Commitment List". Rivals.com. Retrieved December 27, 2015. "Notre Dame College Football Recruiting Commits". Scout.com. Retrieved December 27, 2015. "ESPN". ESPN.com. Retrieved December 27, 2015. "Scout.com Team Recruiting Rankings". Scout.com. Retrieved December 27, 2015. "2013 Team Ranking". Rivals.com. Retrieved December 27, 2015. Fuller played sparingly as a freshman at Notre Dame, catching only six passes. He scored his first touchdown on a 47-yard pass from Tommy Rees against Air Force on October 26, 2013. He recorded 160 receiving yards in that game, averaging 26.6 yards per catch, which led the team. Fuller emerged as a starter his sophomore year following an impressive off-season, following that up by having a breakout season for the Irish. He recorded 76 receptions for 1,094 yards with 15 touchdowns, tying Golden Tate for the school single season record. His 15 touchdowns were tied for 3rd in FBS, behind Colorado State's Rashard Higgins and Alabama's Amari Cooper. In a game versus Northwestern, he caught nine passes for 159 yards and 3 touchdowns; all career highs. He was recognized as an honorable mention All-American by Sports Illustrated following the season. Fuller started off his junior season with two touchdowns on 7 receptions for 142 yards versus Texas. The following week, against the Virginia Cavaliers, Fuller caught 5 passes for 124 yards and two touchdowns, including the game-winning touchdown pass with 12 seconds left from DeShone Kizer. He had 6 receptions for 131 yards and a touchdown against Georgia Tech in Notre Dame's third game of the season, a 30–22 victory. Against USC, he recorded 3 receptions for 131 yards, including a 75-yard touchdown to beat USC, 41–31. At Pitt, Fuller caught 7 passes for 152 yards and three touchdowns leading to 42–30 victory. His three touchdowns allowed him to surpass both Golden Tate and Jeff Samardzija on the career touchdown list with 28, leaving him only second behind Michael Floyd's 37. Fuller caught 6 passes for 113 yards, including an 81-yard touchdown, in a losing effort against Ohio State in the Fiesta Bowl. Fuller finished the season with 62 catches, career high 1,258 yards with 14 touchdowns. He was named a second-team All-American by the Associated Press. On January 3, 2016, Fuller announced he would forego his senior year and enter the 2016 NFL Draft. He finished his Notre Dame career with 144 receptions for 2,512 yards (17.4 avg) and 30 touchdowns. At the 2016 NFL Scouting Combine, Fuller ran a 4.32 official 40-yard dash, which was the best time among wide receivers. Fuller was drafted by the Houston Texans in the first round with the 21st overall pick in the 2016 NFL Draft. He was the second wide receiver taken in the 2016 NFL Draft, only behind Baylor's Corey Coleman, who went to the Cleveland Browns with the 15th overall pick. In his first career regular season game against the Chicago Bears on September 11, 2016, Fuller had five receptions (on 11 targets from quarterback Brock Osweiler) for 107 yards and a touchdown as the Texans won by a score of 23-14. During Week 2 against the Kansas City Chiefs, Fuller had 104 receiving yards on four receptions, including a juggled catch for 53 yards. The Texans won by a score of 19-12. In Week 4 on October 2, Fuller returned a punt 67 yards for a touchdown against the Tennessee Titans. In doing so, he became the first player in Houston Texans franchise history to record a punt return touchdown and a receiving touchdown in the same game (as he had a touchdown reception earlier in the game). On January 7, 2017, Fuller made his postseason debut against the Oakland Raiders in the Wild Card Round. He had four receptions for 37 yards in the 27–14 victory. His postseason would end the following week in the Divisional Round against the eventual Super Bowl LI Champion New England Patriots. In the 34–16 defeat, he had three receptions for 16 yards. In his rookie season, Fuller had 47 receptions for 635 yards, 196 return yards, 2 receiving touchdowns, and 1 return touchdown. On August 2, 2017, during training camp, Fuller suffered a broken collarbone and was expected to be out 2–3 months. On September 27, 2017, Fuller was upgraded to full participation in the Texans' practice. He made his season debut for the Texans on October 1, 2017 in a 57–14 win against the Tennessee Titans. Fuller caught four passes for 35 yards and two touchdowns. Fuller finished the 2017 season with 28 receptions for 423 yards, 135 return yards, and 7 receiving touchdowns. Fuller missed the 2018 season opener with a hamstring injury. He made his season debut in Week 2 against the Tennessee Titans as the second receiver on the Texan's Depth Chart. He had eight receptions for 113 yards and a touchdown in the 20–17 loss. 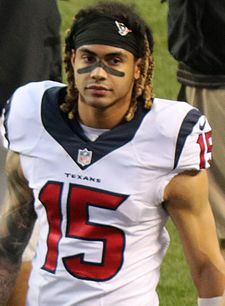 In the following game, a 27-22 loss to the New York Giants, Fuller had another solid outing with five receptions for 101 receiving yards and a touchdown. During Week 4, Fuller notched his third consecutive game with a touchdown in a 37-34 overtime victory over the Indianapolis Colts. During Week 8 in a 42-23 victory against the Miami Dolphins, Fuller tore his ACL, prematurely ending his season. In 7 games, Fuller finished the 2018 season with 32 receptions for 503 yards and 4 touchdowns. ^ Robertson, Dale. "10 things you need to know about Will Fuller". Houston Chronicle. Retrieved April 25, 2018. ^ Vorel, Mike. "Surging WR Will Fuller represents Philadelphia at Notre Dame". South Bend Tribune. Retrieved April 25, 2018. ^ "William Fuller profile". Yahoo! Sports. April 20, 2011. Retrieved September 19, 2015. ^ Jones, Ben (June 3, 2012). "Philly Receiver Will Fuller Commits to Nittany Lions". Statecollege.com. Retrieved September 19, 2015. ^ "Will Fuller decommits from Penn State Nittany Lions, picks Notre Dame Fighting Irish". Espn.go.com. Retrieved September 19, 2015. ^ "Notre Dame vs. Air Force - Game Summary - October 26, 2013". ESPN.com. Retrieved October 5, 2018. ^ "Notre Dame wide receiver Will Fuller's star is on a lightning-fast rise". Elkhart Truth. September 10, 2014. Retrieved September 19, 2015. ^ "2015 FBS (I-A) College Football Individual Statistics Leaders for Receiving – ESPN". Espn.go.com. Retrieved September 19, 2015. ^ Blazek, Nicholas D. (December 19, 2014). "Notre Dame's Will Fuller All-American Honorable Mention". Slapthesign.com. Retrieved September 19, 2015. ^ "No. 9 Notre Dame beats Virginia 34–27 on last-second TD pass". HeraldNet.com. September 12, 2015. Retrieved September 19, 2015. ^ "Prosise scores 3 TDs as Irish shut down Ga. Tech". espn.com. September 19, 2015. Retrieved September 19, 2015. ^ Lesar, Al. "Will Fuller scores thrice in Notre Dame victory over Pitt". Notre Dame Insider. ^ AP All-America Team, List, collegefootball.ap.org; accessed April 28, 2016. ^ Reineking, Jim. "Notre Dame's Will Fuller will enter 2016 NFL Draft". NFL.com. ^ Ganguli, Tania. "Texans select Will Fuller in first round of 2016 NFL Draft". ESPN.go.com. ESPN. Retrieved April 28, 2016. ^ Patra, Kevin. "Texans' revamped offense flashes in win over Bears". NFL. Retrieved September 11, 2016. ^ "Fuller makes juggling catch for 53-yard reception". Sports Illustrated. Retrieved September 18, 2016. ^ "Watch Texans rookie Will Fuller return a punt 67 yards for a TD". Fox Sports. Retrieved December 31, 2016. ^ "Wild Card - Oakland Raiders at Houston Texans - January 7th, 2017". Pro-Football-Reference.com. Retrieved August 2, 2017. ^ "Divisional Round - Houston Texans at New England Patriots - January 14th, 2017". Pro-Football-Reference.com. Retrieved August 2, 2017. ^ "Will Fuller 2016 Game Log". Pro-Football-Reference.com. Retrieved August 2, 2017. ^ Orr, Conor (August 2, 2017). "Texans WR Will Fuller breaks his collarbone in practice". NFL.com. ^ "Fuller upgraded to full participant in practice". Retrieved October 2, 2017. ^ "Will Fuller returns with bang, helps boost offense". Retrieved October 2, 2017. ^ "Will Fuller 2017 Game Log". Pro-Football-Reference.com. Retrieved October 5, 2018. ^ "Texans' Will Fuller: Out Sunday". CBSSports.com. Retrieved October 5, 2018. ^ "Texans wide receiver Will Fuller excels in loss to Titans". Houston Chronicle. September 17, 2018. Retrieved October 5, 2018. ^ "Will Fuller, V notches 100-yd, 1 TD game in loss to Giants". Houston Texans. Retrieved October 5, 2018. ^ "Texans end losing streak with 37-34 win over Colts in OT". KRIV. Retrieved October 5, 2018. ^ Teope, Herbie (October 26, 2018). "Texans' Will Fuller done for season with torn ACL". NFL.com. Retrieved October 26, 2018. This page was last edited on 14 April 2019, at 19:17 (UTC).